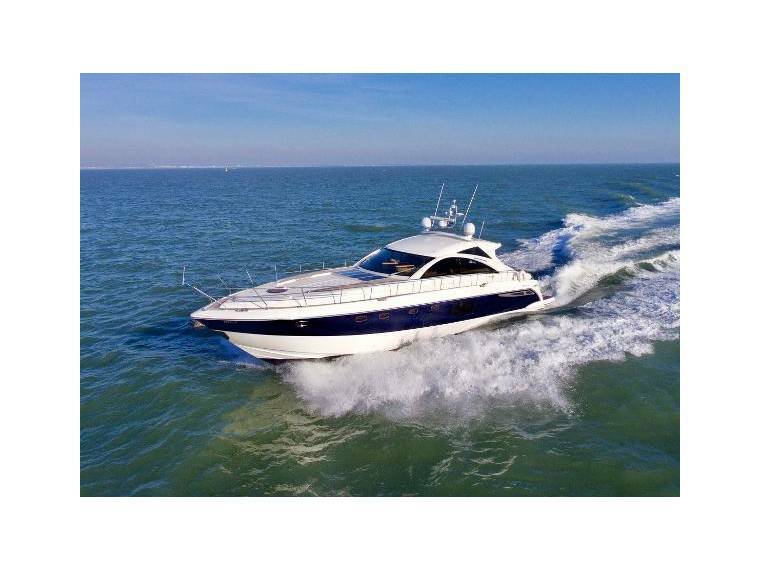 As the flagship sports cruiser model in Fairline’s 2008 range, the Targa 64GT needs no introduction. 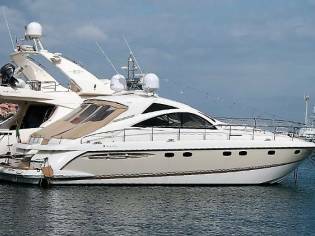 Offering a huge internal volume, an impressive level of high-end detailing and exhilarating performance for a craft of this size, she is a very well-rounded package.“DIVA” is a 2008 Model Year with trademark Fairline dark blue gelcoat hull, contrasting with a very modern feeling light oak interior. Power comes from a pair of larger-option twin Caterpillar C***.***. 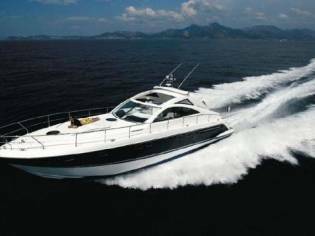 ***hp shaft drive diesel engines, giving a top speed in excess of 33 knots, and a very comfortable cruise speed of circa 24 knots. Her inventory includes all the extras needed to create a serious Northern European or Mediterranean cruiser – Eberspacher diesel heating with screen demisters, separate reverse-cycle air conditioning system, a full-suite of Raymarine navigation equipment including twin E120 large screen plotters, DSC VHF, open array Radar, autopilot, bow and stern thrusters (with remote), upgraded 17.5 kVA Onan generator, Loewe TVs throughout, KVH M5 TracVision, B&O AV system, cockpit BBQ, passerelle, tender garage and much more. 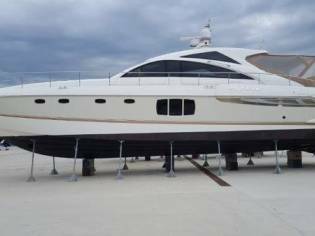 Lifted for new antifouling, polishing of stern gear, new annodes and hull polish mid January 2019. Currently lying afloat in Portsmouth Harbour and available to view 7 days a week by prior notice. Further photos available by request. Worldwide delivery can be arranged at additional cost, please ask for further details. Midships master stateroom with a large island double dock, hanging wardrobes, high level stowage cupboards and drawers, upgraded mattress, individual reading illumination, Loewe Spheros LCD TV with B&O AV/DVD unit. Direct access through to en-suite quantity room, complete with electric newwater flush toilet and hand tank. Separate shower stall with chair and teak flooring. 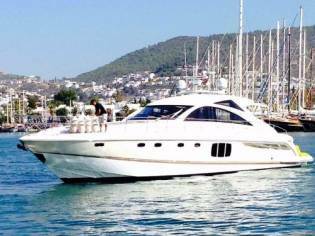 VIP Guest cabin forwards with large centreline island double dock, opening seaport illumination, vanity station either side of cot, pair wardrobes, stowage drawer under cot, Loewe Xelos LCD TV and DVD stereo. En-suite quantity room with electric newwater flush toilet, hand tank and apart shower stall. 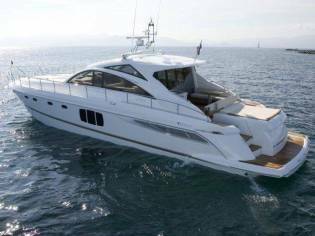 Guest cabin midships to Port, with pair single docks, opening seaport illumination, large hanging wardrobe, high level stowage cupboards, Loewe Xelos LCD TV on swing out bracket. Guest/Day quantity room with electric newwater flush toilet, hand tank and apart shower stall. Lower dinette with L-shaped leather sofa to Starboard, corner galley with large stainless steel sink, electric ceramic hob, pair drawer refigerator/freezer, microwave convection oven and provision stowage. 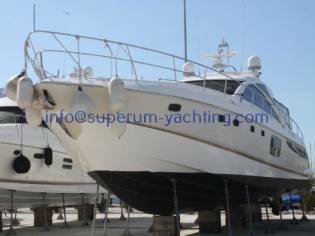 Deck-level bar, with U-shaped leather sofa to Port, electric height-adjusdesk dining desk and linear sideboard opposite.